As early as 1845, two years before Denton County was organized, settlers began making their homes near the place known as "Pilot's Point," situated on the edge of the Cross Timbers Section of Texas. These settlers had migrated from Arkansas, Tennessee, Kentucky, and Missouri to establish themselves on either the rich, endless black-land prairies to the east or the expanses of sandy, wooded land to the west. The highest point of land in the area was a small hill on which the City Square is now located. Oak trees covered much of the hill. Standing tall among the oaks was a magnificent cottonwood tree that could be seen from a great distance. This high, wooded point of land was a landmark for the Indians and later for rangers, scouts, and other travelers, guiding them across the sprawling, trackless land. The landmark, known as Pilot's Point, gradually became known simply as Pilot Point. A short distance north was Dripping Springs, which provided excellent water and a pleasant campground for Indians, rangers, and cowboys. Located on the Charles Smith Grant from the Republic of Texas, the small settlement with its inviting grove and nearby springs soon attracted many permanent settlers. On Christmas Day 1853 the town was plotted by Surveyor George W. Newcomb. On February 11, 1854, a plat of the town of Pilot Point was laid off by James Pierson for the heirs of Charles Smith. After being duly certified, the plat was recorded June 28, 1854, in the Denton County Courthouse. Immediately, James Peirson, for the Charles Smith Estate, began to sell land in the newly laid out town and the surrounding area. One of the first to buy land was Dr. R. W. Eddleman (1825-1904), who came with his wife from Missouri. On the northwest corner of the Square in 1852 he built his home and drugstore. There he practiced medicine. In 1856 to this couple from Missouri was born their first child, L. Z. Eddleman, the first child born in Pilot Point. The early townspeople demonstrated courage, perseverance, and ingenuity. Life often was not easy. All supplies were brought by wagon train from Shreveport, Louisiana, or Jefferson, Texas. Usually each wagon was pulled by six or seven oxen, and the round trip made by the wagons required several weeks. In 1853 D. W. Light came from Kentucky and put cattle on the sprawling range east of Pilot Point. The Emberson brothers were among other cattlemen who used the free range. After the state of Texas opened the range country to settlement, these families and others became owners of large ranches. The town continued to develop. A grist mill was built one block south of the Square in 1854. Major James D. Walcott, a Rhode Island native, moved to Pilot Point from Missouri in 1854, opening the first general merchandise store in the town. He also became the first postmaster on June 12, 1855, when the first post office was established. About a year later Alphius Knight, a native of New York state and a graduate of a normal, opened and conducted the first school in town. Two churches were organized in the year, 1856: the First Baptist Church, still using its original building on Main Street, and the Methodist Church, located on the original site but using now a structure first used for worship in 1986. By the time of the Civil War, the elements needed to sustain a small but flourishing community were in place. Then came the war. Led by Captain N. Wilson, a company of one hundred one men was organized in 1861. It left to join the Confederate forces. During the war years, cattle and horse thieves plagued the Pilot Point area. The "Regulators" was a group of townspeople who undertook to keep law and order. It is said that east of town on a large oak tree there were six cattle rustlers hanged at the same time. Law enforcement continued to be difficult during Reconstruction days. The small town found it necessary to have nine law enforcement officers in 1871 and 1872. The spirit of progress and the desire for orderly development were present in the people of Pilot Point. In 1872 the Pilot Point Seminary was established. It attracted local students as well as those living outside the area. It was a fine institution of learning. By 1892 the name was changed to Franklin College, an outstanding subscription school with fifteen teachers for students from the primary grades through college. The coming of the public schools in Pilot Point in 1894 led to the gradual decline of the enrollment at Franklin College, which ceased operation in 1900. Pilot Point was on the route of the Butterfield Stage, which brought the mail, and then in 1877 came the first telegraph line, or wire, running from Sherman west through Pilot Point along "Wire Road," known today as Farm Road 1192. The telegraph line extended to a government post at Jacksboro. Pilot Point's first telegrapher was Ed Reaves, son-in-law of former Governor Throckmorton and later the chief telegrapher at the White House. Using brick made locally, John Merchant in 1872 erected on the northeast corner of the Square, the first brick building in Denton County. Soon all the business houses around the Square were replaced with brick buildings. The town's first newspaper, The Post, appeared August 31, 1878. The Post's successor, through several consolidations throughout the years, was The Post-Signal, which is still covering the news of Pilot Point and the surrounding area. In the autumn of 1880 the first train rolled through Pilot Point over the newly constructed line of the Texas and Pacific Railroad. Under a lease arrangement a few years later, the Missouri, Kansas, and Texas Railway ran over the same track, the two lines giving Pilot Point excellent passenger and freight service for many years. 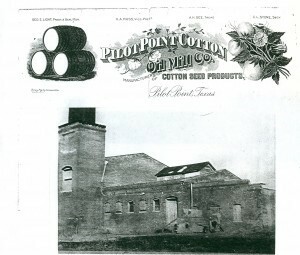 A cotton gin was built by Henry Selz and J. P. Cooper. It was the largest gin the United States at that time. The first bank in town, a private one, opened in 1884. Eight years later it became the Pilot Point National Bank and continues, as the recently renamed Point Bank, to serve Pilot Point and this area through several branch facilities. The early years of the 1900's found Pilot Point humming with activity as a marketing center for farmers and stock raisers, who, then as now, experienced good years and bad years. By the 1920's there were fifty business establishments, three banks, nine churches, a free public school system, a hotel, beautiful homes, two federated women's clubs, and several fraternal organizations, one being the Masonic Lodge, A. F. and A. M. Chartered in 1862, the local lodge is one of the oldest in Texas. Years have passed. Horse ranches and industrial developments have come into the mainstream of the economy, although cattle ranching and farming are still strong operations. 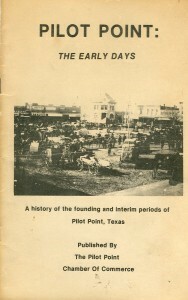 Pilot Point, a delightful place to live, is a very special town with an interesting history and a bright future.